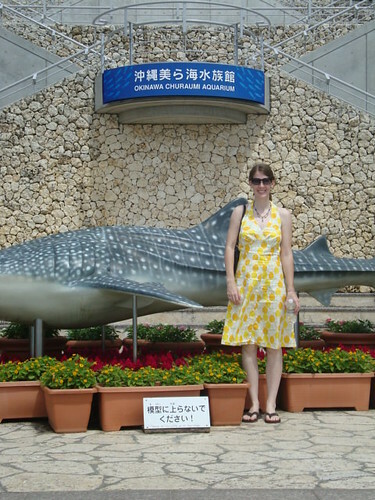 Sometimes I feel really bad about having this blog, since I absolutely never update. I keep saying I will, but that seems to only last for about a week before the drive disappears again. So New Year’s resolution: To actively document all my crafting and learning, and use this blog as a way to document it. Maybe if I view it more like my own personal scrapbook, it will get some more attention. So to begin, Let’s start with a look back at 2011, in terms of Things I’ve Made. Almost exactly one year ago, I decided the only response to a snowstorm was to knit cowls. How could knitting a cowl not help when it’s snowing out, right? So I knit two very basic cowls, just to give me something to do. February saw lots of knitting on a secret project, but it really just looked like a giant white blob at the time, so we’ll skip it for now. March was filled with lots of creativity! I joined a “hand/homemade” swap, and needed something cute to send to my swappee. So I busted out my Great-Great Aunt’s old Singer 600 sewing machine, knit a drawstring bag and sewed a lining into it. The lining fabric was just a cheap cotton in an easter print, but very cheerful and cute. My coworker was expecting his first child in the spring of 2011, so I figured this was a perfect opportunity to knit a baby sweater pattern I had been drooling over. This is “Baby Yours” by the Yarn Harlot. The pattern was adorable, but I think next time I might knit it all in one piece. If it’s going on a baby anyway, I’m sure the kid won’t mind that the structural integrity is a little wonky. ( I apologize for the poor picture. I was running on a deadline, and didn’t have time to wait for good lighting). Over the summer I knit nothing except my wedding veil. 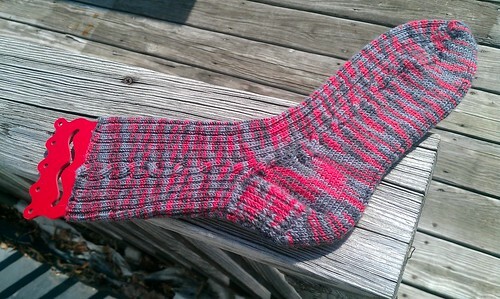 I knit it out of Knit Picks gloss in white, 1600m. Here is the veil progress through 2011, with the exception of blocking photos. I didn’t block it, so I have no proof. I’ll need to get a photo of it sometime before the wedding. Of course, that doesn’t mean I couldn’t partake in other crafts! I decided it was time to give my great-great aunt’s machine a solid run, and sewed a dress to wear on my trip out to Japan in June. I originally cut the dress WAY too large, and ended up having to dismantle, recut, and resew the entire thing. I still love the final product though. It’s so nice and cheery, perfect for a sub-tropical island. (Ignore the wrinkles. It had just survived 48 hours of straight traveling). This fall I needed a quick project to work on when I got tired of the veil. The perfect project for me is of course, the trilobite hat.This took just a few hours to knit up, and is perfect for any north-midwest geologist or paleontologist. I love this hat. I even knit it up with my own handspun merino. Of course, what year would be complete without a pair of socks for J? 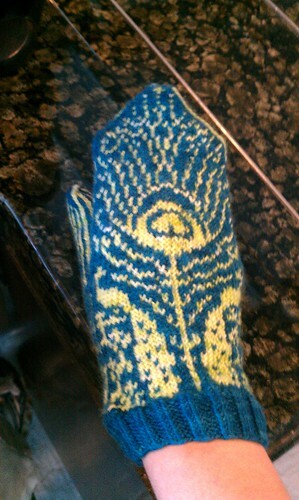 He now officially has more handknit socks than I do. I have threatened not to knit him another pair until I have some, too! 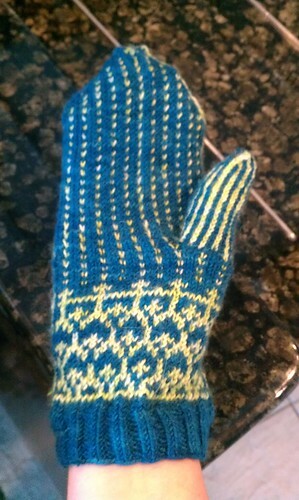 I also knit a pair of mittens for a friend who got halfway through one, and realized she despised colorwork. These were a blast to knit, and I wish I could have kept them for myself! Pattern is Mystery + Manners by SpillyJane. Unfortunately, I was laid off at the beginning of November this past year, so I had to get a bit creative with Christmas gifts. 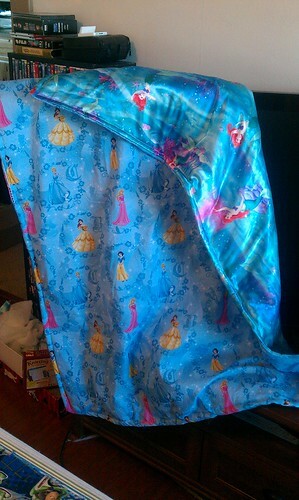 My soon-to-be niece and nephew each received quillows. Unfortunately, I only took a photo of hers, and it’s not even a completed photo! J received a pair of pajama pants, but convincing him to pose in pj’s for a photo is like trying to convince a cat that baths are really lots of fun. 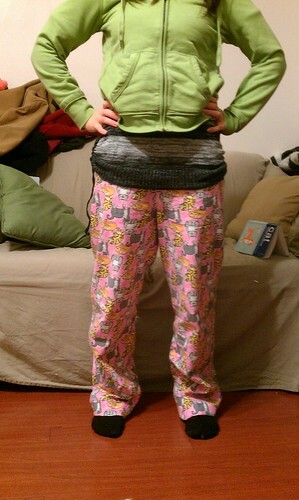 Finally, my dear friend JL received a pair of her own pajama pants, in a cat print. I will argue that the print is upside down because this way the cats are looking up at her, but it’s really because I get excited and rushed through making them without thinking. Whoops. And there is 2011 in sewing and knitting projects! My goal for 2012 is to use my sewing machine more to create clothing for myself and J, and to push my personal limits with my knitting abilities.